Home / news / IESA partners with Three Unfit Dads!! Eric Watlington, Andrew Van Der Walt and Nigel Williams are three “unfit dads” from Cape Town, who were caught up in the hype of running their first Two Oceans half marathon. Unfortunately, the Ballot process for this event favours club runners and these semi-novice runners were not chosen to run. When they found out that IESA was nominated as one of the Two Oceans Charity Entries, they saw it as an opportunity to not only “purchase” an entry by raising the funds but to raise awareness for the organisation as well. Hence, the #3unfitdads campaign began!! Three Fathers, One goal to complete their first half marathon, and only twelve weeks to get ready! Each Dad is trying to get 21 people to sponsor R 100 for one kilometre. In total, they are aiming to then raise R 2100 each. Eric: Well as you know my name is Eric Watlington and I am a Communications Officer for the Hospice Palliative Care Association of South Africa. I am a father of 3 beautiful children Shiloh (9 years), Hannah ( 5 years) & Rachael (4 years) who and they keep me busy regularly! Eric loves spending time with his three kids at the beach. 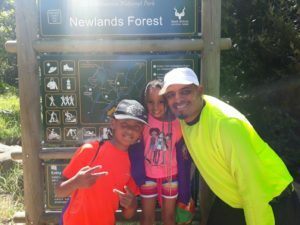 Training for the Two Oceans Half Marathon has given Eric the opportunity to spend more time with his children in the quest to get fitter. IESA: What were your experiences of school growing up? Eric: I was very fortunate to be able to attend a good school where the discipline was quite strict. Those days teachers were allowed to hit us with canes! It was a multi-racial school ( both primary and high school) and for me, it was quite interesting being able to absorb and experience different cultures. IESA: Have you ever experienced exclusion yourself? Eric: I have never experienced exclusion, however, I know that everyone is different especially when it comes to learning styles. For me personally, I tend to be drawn to visuals and pictures in order to tell a story rather than plain text. Inclusive Education, in my opinion, means Inclusivity of everyone whether or not you have a learning disability – everyone should be treated equally. IESA: What does running/exercise mean to you? Eric: Funny enough – when I was young, exercise was a natural thing whether it came to playing soccer, athletics – it was just part of the norm. As you become older your metabolism starts to slow down and before you know it, you picked up so many kilos and have no energy to live life! So I try to force myself to exercise to eliminate stress…and kilos of course! IESA: Why did you get involved in this initiative? Eric: Well…apart from my trying to please my wife, I am always drawn to initiatives that impact people. I love seeing communities transformed for the better and overcoming their hurdles. IESA: What are you hoping to personally achieve through this campaign? Eric: I am hoping to raise more awareness of Inclusive Education as I feel that many people are seeking help and guidance for their children but are not sure where to start – hopefully this message can go viral!! 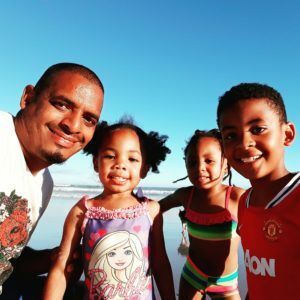 IESA: Any words of wisdom to other dads out there? Eric and his son, Shiloh, participating in a 5km walk. 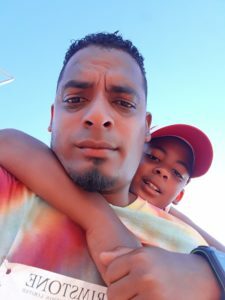 Eric, along with our other unfit dads, needs 21 sponsors to donate R 100 each in order to reach his target of R 2100.00 If you would like to support him, please go to www.givengain.com/cc/3unfitdads/ to support the cause. To read more about our dads and their initiative click here.